In Arizona, it is illegal for any person or entity to encroach on a state highway right-of-way without obtaining an encroachment permit. AAC R17-3-502(A). The Arizona Department of Transportation (ADOT) administers encroachment permits pursuant to AAC R17-3-500 Highway Encroachments and Permits. Encroachment is defined as, “any use of, intrusion upon, or construction of improvement within a state highway right-of-way by any person or entity other than the Department (ADOT) for any purpose, temporary or fixed, other than public travel authorized by state statute.” AAC R17-3-501. Change in the principal activity or function of an abutting property where an access or utility encroachment has been constructed. AAC R17-3-502(B). For encroachments involving access, only an abutting property owner is eligible to apply for a permit. AAC R17-3-503(B)(1). For utility installations, only an ultimate owner who will be responsible for maintenance and liability of the utility after it is put into service is eligible to apply. However, a contractor may apply if the contractor provides evidence that an ultimate owner has approved plans and agrees to obtain an encroachment permit as a new owner upon completion of the utility installation. AAC R17-3-503(B)(3). For additional information, consult the ADOT Policy for Accommodating Utilities on Highway Rights-Of-Way. Purpose of proposed encroachment, as listed in R17-3-502(B), and a description of the proposed work or activity in the right-of-way. AAC R17-3-504(B)(1-6) By signing an application, the developer agrees to accept the general obligations and responsibilities listed in AAC R17-3-504(C)(1-14). In addition, developers may need to provide the ADOT with supporting documentation. AAC R17-3-505. Supporting documentation may include a traffic control plan. ADOT Policy for Accommodating Utilities on Highway Rights-Of-Way, 1.12.2. For more information, consult the ADOT Encroachment Application Instructions. 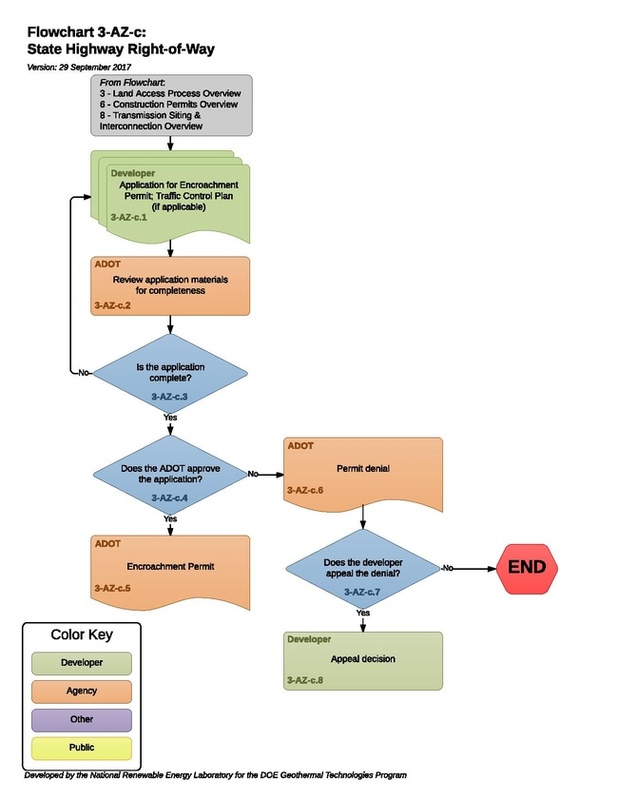 Upon receipt of an application, the ADOT reviews applications for administrative completeness. Within 30 days, the ADOT will issue a written notice of administrative completeness or deficiencies. ARS 41-1074 and AAC R17-1-102 Table B. 3-AZ-c.4 – Does the ADOT Approve the Application? The developer agrees to comply with the ADOT’s requirements as set out in the permit. AAC R17-3-507(C). Otherwise, the ADOT will deny the permit. Mitigate potential harms to national or state security. An explanation of the developer’s right to appeal the denial. The explanation will include the number of days in which the developer must file a protest challenging the denial and the name and telephone number of an agency contact person who can answer questions regarding the appeals process. ARS 41-1076 If the developer does not choose to appeal, the process ends. If the developer does choose to appeal, the appeal must be timely and comply with the requirements stated in the ADOT’s written permit denial. This page was last modified on 29 September 2017, at 12:59.